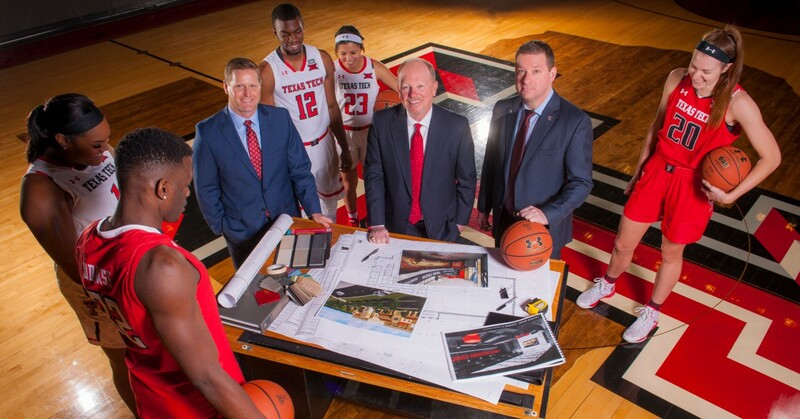 Texas Tech athletics director Kirby Hocutt, donor Dusty Womble and head men's basketball coach Chris Beard review plans for the new Dustin R. Womble Basketball Practice Center with Texas Tech University student-athletes. 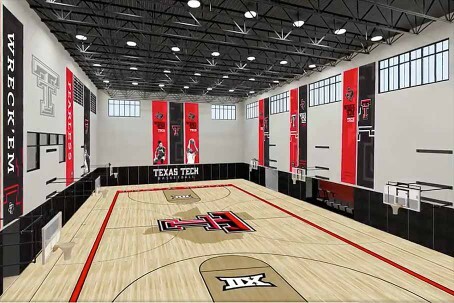 With a practice facility on the drawing boards, Texas Tech University is investing in its basketball teams. Dusty Womble is helping make it a reality. Dusty Womble was five years old when he saw Texas Tech University upset a ranked Arkansas basketball team in 1964 at the Lubbock Coliseum. He also remembers sitting on the grass in the north end zone of then-Jones Stadium — catching red plastic SPS/Texas Tech footballs. “Sparkie the electrician guy was on them,” he said. Womble went on to create a very successful life and stayed connected to Texas Tech. He graduated from the university in 1981 with a degree in management information systems. While still in school, he started Interactive Computer Designs (INCODE), eventually selling it to Tyler Technologies, now a $6 billion public company selling software and services to local government and schools. Although he retired in 2016, he remains on Tyler’s board of directors. He’s missed only one Texas Tech home football game since 1977 and can’t tell you the last time he missed a home basketball game. 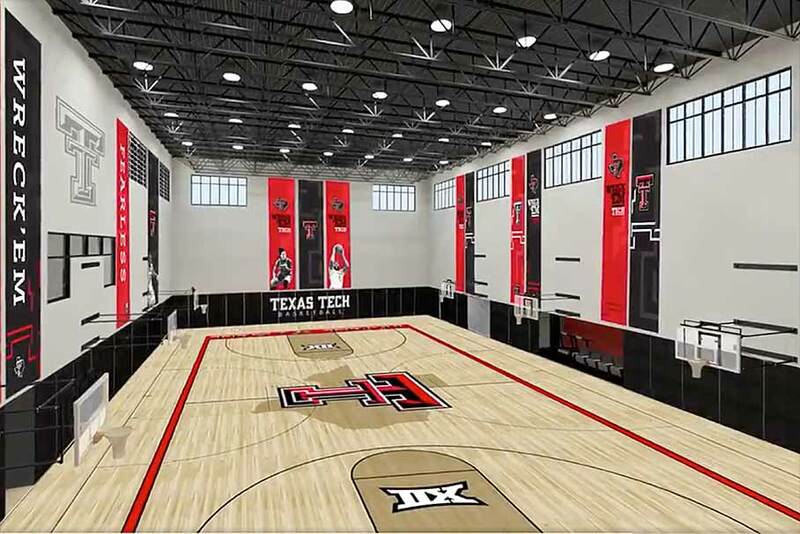 In recent years he’s become close to the men’s basketball program, and Texas Tech Athletics announced late last year that Womble had donated $10 million toward a new basketball “headquarters” — the Dustin R. Womble Basketball Practice Center. 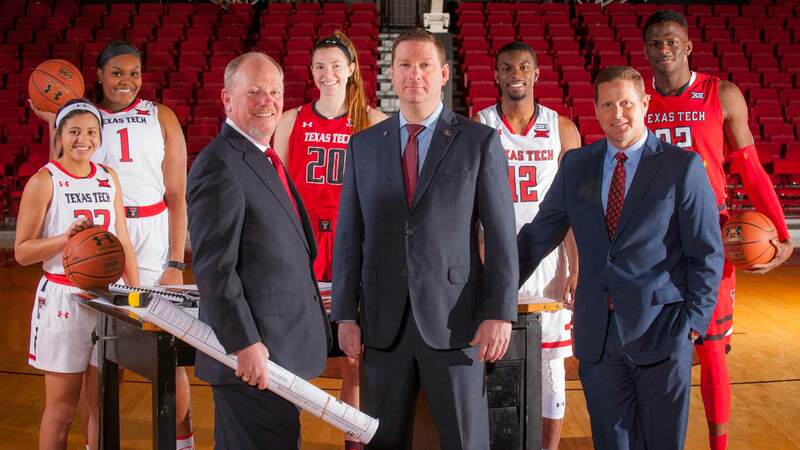 The gift — one of the largest commitments to The Campaign for Fearless Champions, the ongoing fundraising initiative for Texas Tech Athletics — solidified plans for the future home of Texas Tech basketball. It will be built across the street west of United Supermarkets Arena, serve both men’s and women’s teams, and could open by 2020. 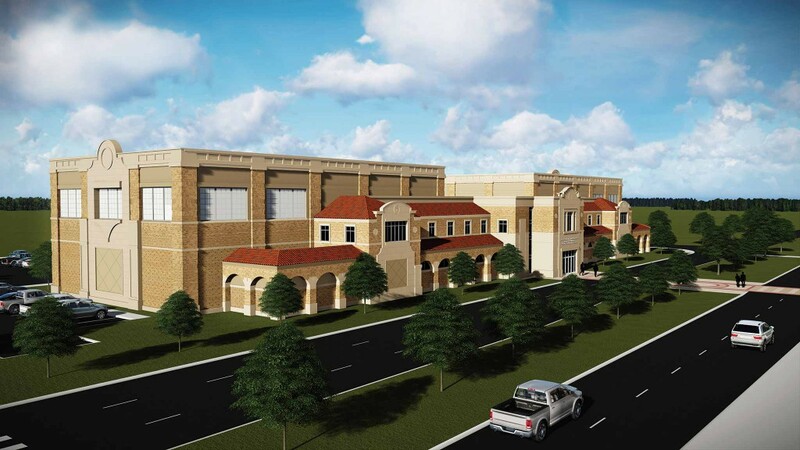 An architectural rendering of the planned Dustin R. Womble Basketball Practice Center to be located on Indiana Avenue, west of the United Supermarkets Arena. “We have the best game-day facility, but we’re behind the times in terms of a practice facility. And we’ll have the nicest in the country,” said Beard. While Beard acknowledges that United Supermarkets Arena is a great home for games, both basketball teams have to share it with volleyball and loads of events. “We have two courts, but three teams, and combine that with graduations, Garth Brooks and other concerts and events — now we’ll have a court that’s all ours,” he said. That means no adjusting practice times and trying to make it work with student-athletes’ different class schedules. The main lobby, left, features a wrap-around digital display that can broadcast games, showcase team accomplishments and welcome recruits. The Womble features two full-sized indoor courts, right, which will give teams dedicated access seven days a week. And integrated film rooms, team lounges and coaches’ offices, designed to promote interaction between the team and coaching staff. “This keeps everything centralized and organized. Being efficient with your time is key to being successful,” said Beard. 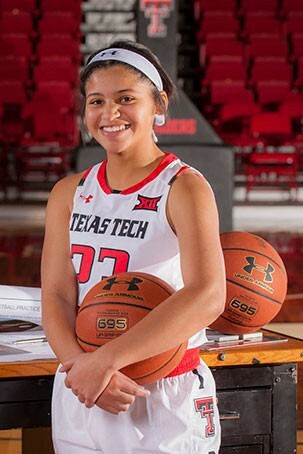 It will also aid recruiting — helping the Red Raiders attract McDonald’s All-Americans and “one-and-done” players, said the coach. “Players want to play where basketball is a priority and the administration has made a massive commitment. We clearly have an administration, community, fan base and season ticket holders who want to win the Big 12,” said Beard. “This facility will translate to winning. And Beard appreciates how Womble has made Texas Tech hoops a priority. “Dusty’s an elite person. He wants to win. He really sees this as a way to help the program win and the relationship between getting these facilities and getting better players,” he said. The donor is excited with the impact his gift is making. “This will be one of the nicest in the country. This will be a facility others schools will come and try to emulate on their campuses,” said Womble. For Womble and his wife, Leisha, the timing was now. “It will serve both programs equally,” said Hocutt. “It’ll be a first-class home for Lady Raider basketball — a program with a great history and the only team title in school history,” he said. The Womble will help the Lady Raiders recruit some of the best women’s basketball recruits in the country, said Hocutt. “It will be a point of pride and great place for them to pursue their hopes and dreams. It was a distinguishing point for recruits to see the investment and the facility we’ll have,” he said. It is also a selling point as the university searches for a new women’s head coach. “As we go out and identify the very best leader to lead this basketball program, having the best facility in the country is a selling point as well,” he said. Freshmen Jarrett Culver and Angel Hayden look forward to using the Womble before their time at Texas Tech is done and say the project was part of the reason they chose to become Red Raiders. “It helps to be able to practice on our own time and space to get work in and not get interrupted by other teams,” said Hayden, who played up Interstate 27 in Canyon, Texas. She said it will save her time going across campus — especially when needing study time. “Sometimes I go to the library or the Marsha Sharp Center or a little area we have. It will help a lot,” she said. Hayden has already learned a lot about nutrition since coming to the university and knows it will be even better once the Womble is built. “I’ve learned how to split my food to maintain or lose weight — and they take into consideration what you like,” she said. “We’ll be able to snack right here and it’s really cool,” she said, adding she appreciates having people to consult about nutrition. The Womble will be built less than three miles from where Culver played high school basketball at Lubbock’s Coronado High School. The freshman — who’s gained national attention for his play this season for the Red Raiders — has seen bits and pieces of what will be built and likes what he sees. “We’re beyond blessed to have it and glad [Womble] did it — it will make our basketball program better,” said Culver. “I don’t feel like other facilities can compare to this one. Feel like this will be top of the top. Everything’s top notch. We can get workouts and eat there, rest there, play pingpong,” he said. Culver says he spends six-to-seven hours a day on basketball, three hours in class and additional time for homework. “It’s a pretty full day. I’ll spend less time going around campus and get more things done in an orderly amount of time,” he said. The idea for philanthropy to drive planning for the facility came from The Campaign for Fearless Champions, said Hocutt. Announced in 2014, the university’s first fundraising effort focused on student-athletes set about enhancing athletic facilities, investing in student-athlete scholarship endowments and growing the first-of-its-kind J.T. & Margaret Talkington Leadership Academy. 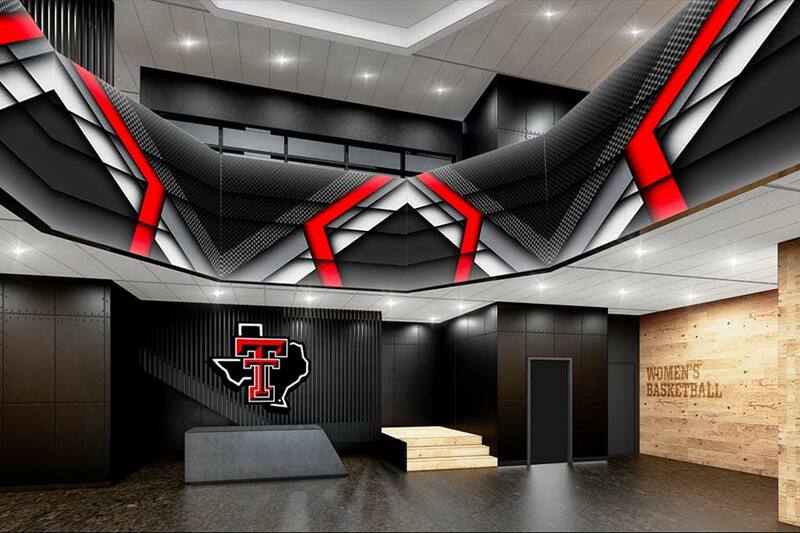 This fall, donors had successfully funded almost all of the campaign’s list of 25 facilities improvements — the crown jewel being the recently opened Sports Performance Center just south of Jones AT&T Stadium. 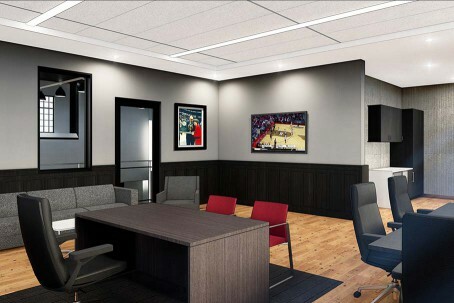 Coaching offices will be located in the building so that the entire program benefits from increased collaboration. With such strong momentum, Hocutt identified four additional projects to add to the campaign’s final phase. “The need for a basketball practice facility rose to the top of the list,” said Hocutt. Discussions had been getting pretty serious, with Womble scheduled to meet with Hocutt and then-head coach Tubby Smith just before Smith left to coach at the University of Memphis. “We had just really started those conversations, and they got derailed,” said Womble. When Hocutt interviewed Beard to replace Smith, he made no promises, but said a standalone practice facility was a priority. Beard was busy recruiting the first six months on the job. But discussions on the practice facility eventually started again. “Last season it was more of a discussion of what it would look like. My commitment to Tech was made in May of last year,” said Womble — then they started working on details. He knew it would make a big impact. Nothing substantial had been built for basketball since the arena opened close to 20 years ago. And the team’s success this season — making the Sweet 16 in the NCAA Tournament for the first time since 2005 — sparked more enthusiasm to support the project, which moved it along faster, said Hocutt. Backed by student-athletes from the women's and men's basketball teams, Dusty Womble, front left, Head Coach Chris Beard, center, and Director of Athletics Kirby Hocutt, right, on the floor of the United Supermarkets Arena. Womble and Beard didn’t know each other, but have become close. “Chris and I hit it off well — he’s very likeable. He loves the university and is dedicated to building a winning program here. It makes it very easy to want to support — even before a lot of success. He’s not here to make the tournament — he’s here to win the Big 12, get to the Final Four and build a national program here,” said Womble. “He would love to be the Coach K of Texas Tech,” he added. “We’ll have a great facility in a great sports town in a Power 5 conference. We give him the resources, he’ll build a nationally prominent program,” said Womble. “It’s fun to watch him coach, he’s very detail oriented. He’s a great motivator of those kids and has a tremendous amount of energy. Coaches can be really good at X’s and O’s, or motivation or recruiting. Some coaches are good at two of three, but Chris is good at all three,” said Womble. 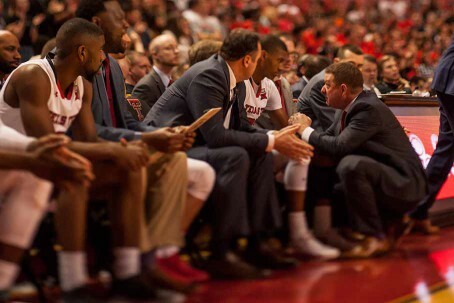 Head Men's Basketball Coach Chris Beard, left photo, takes time to encourage freshman Jarrett Culver during a home basketball game against TCU in 2017. 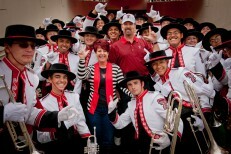 After the game Coach Beard, right photo, stands with men's basketball team members for the singing of the Matador Song. 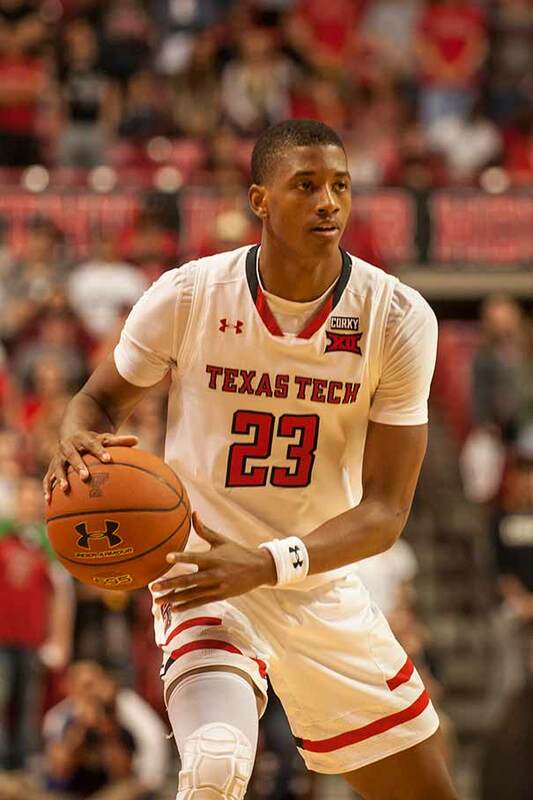 Womble knew this year’s Red Raiders would be competitive, but has been pleasantly surprised with the play of freshmen Culver, Zaire Smith and Davide Moretti. “Chris recruits kids who can play in his system — athletic, quick, willing to play defense and take charges. They’re intelligent enough to utilize the game plan and unselfish enough to put team before personal accolades,” he said. That led to the Red Raiders building a national reputation for defense in Beard’s second season — keeping their opponents shooting 40.2 percent from the field through the NCAA Tournament win against Florida on March 17. They’ve also outrebounded opponents by an average of more than four rebounds a game this season. 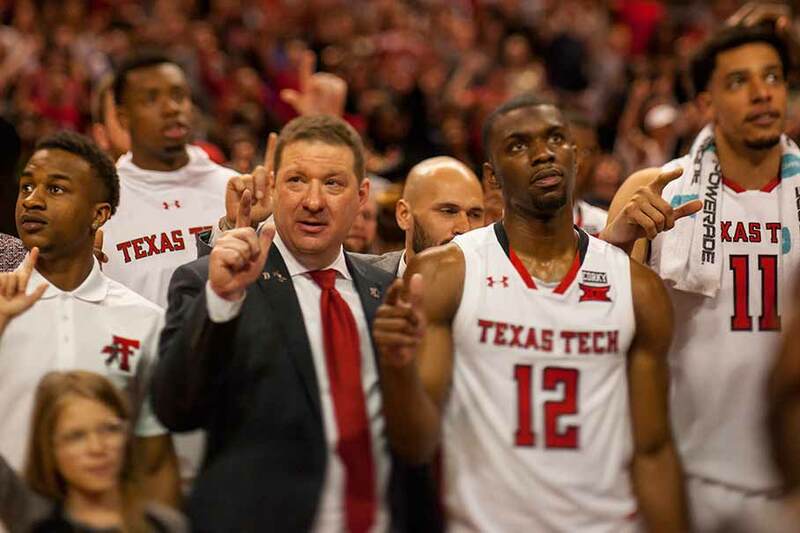 In January, Womble made his fourth trip to Lawrence, Kansas, to watch the Red Raiders face perennial Big 12 champion Kansas in Allen Fieldhouse — a place where Texas Tech had never won. “I told my son Luke before the game, I thought we’d win by 14. It was the first time I was there that I felt we expected to win,” said Womble. The Red Raiders won by a dozen — an early conference sign Beard’s team was better than experts predicted. Make a gift online to support construction of the Dustin R. Womble Basketball Center. Beard appreciates Womble’s support and friendship — impressed with the businessman as much as Womble is impressed with the coach. “He’s a special man,” said Beard. “He’s a super successful, super elite person — but you could be with him at a barbecue and not know what he’s done as a businessman, husband and father. That’s what’s great about West Texas,” said Beard. But the respect between Womble and Beard has the two men looking forward, not reminiscing about the past. 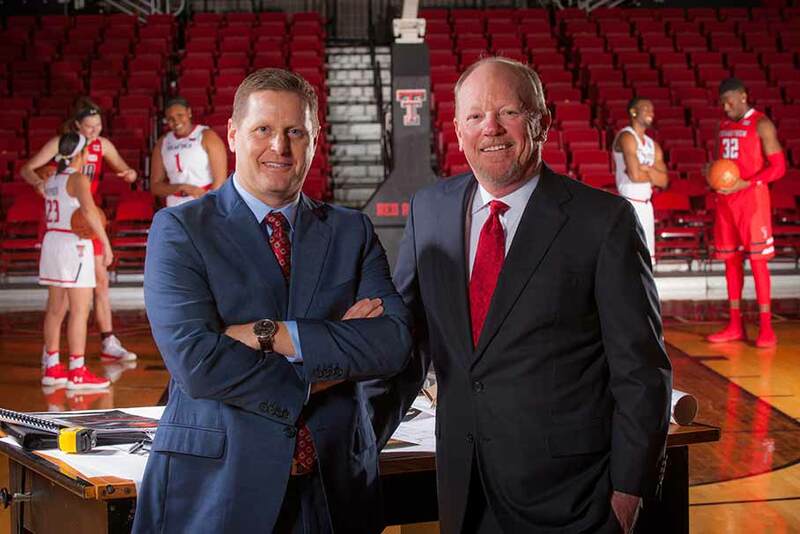 Together, they’re drawing up plans for the next chapter of Red Raider basketball, and the Dustin R. Womble Basketball Practice Center is where it’s all going to happen.